Solid infrastructure. Innovative technology. Proven results. For decades, we have helped small and mid-sized businesses offer top-notch employee benefits. 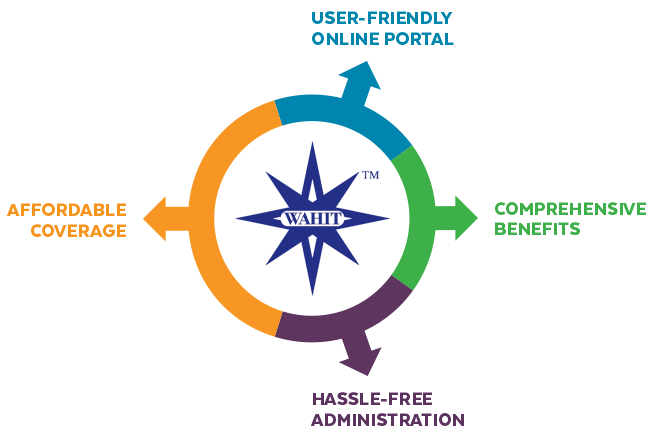 WAHIT makes it easy and cost-effective for small and mid-sized employers to provide competitive employee benefits with a streamlined online benefits marketplace, full-service benefit administration, expert compliance advising, and dedicated customer service. By combining our expertise in small-group health insurance, benefit administration, customer service and technology, WAHIT offers the most comprehensive and effective employee benefits platform. WAHIT supports the vibrancy and health of the small business community in Washington by providing access to the affordable, comprehensive health benefits employers need to maintain a healthy workforce and grow their businesses. We opened our doors in 1997 in Washington state as the Washington Alliance for Healthcare Insurance Trust with a goal of providing comprehensive, affordable healthcare benefits to small businesses in the Pacific Northwest. By pooling a large number of participating employers, we were able to negotiate and arrange group insurance contracts at affordable prices, offering coverage from a diversified portfolio of insurance carriers. By 2014, we had grown into one of the largest association plans in the state, with a membership of 50,000 covered lives. After the passing of the Affordable Care Act (ACA), WAHIT was able to maintain a grandfathered medical association plan as well as non-medical benefits. Companies that enrolled in WAHIT prior to March 23, 2010, and chose to keep their pre-ACA health plans are granted “grandfather” status and may only renew their healthcare insurance through WAHIT “as is” with no medical product changes. The U.S. Department of Labor recently expanded the definition of Association Health Plans and created new opportunities for more groups to form association health plans. Under this rule, and in affiliation with WAHIT, a new association health plan has been created called WAHIT Medical. For more information click here. WAHIT Medical has recently gained approval to begin offering benefit plans in 2019 to new groups in Washington state. We’ve been passionate about providing affordable coverage to small businesses since we first opened our doors in 1997. We have continually improved our offering during decades of disruption in the health insurance and health information technology markets.